Oceansaver® Ballast Water Management System is designed to safely maximize the elimination of waterborne organisms that can be carried in ballast water, consequently, protecting the environment as well as your assets. Choosing the right ballast water management system is highly important decision as system limitations may halt ship operations. TeamTec Oceansaver® is designed and approved by USCG to operate without any restrictions. TeamTec will assist you to determine your ballast water treatment needs, design and deliver a high quality system. 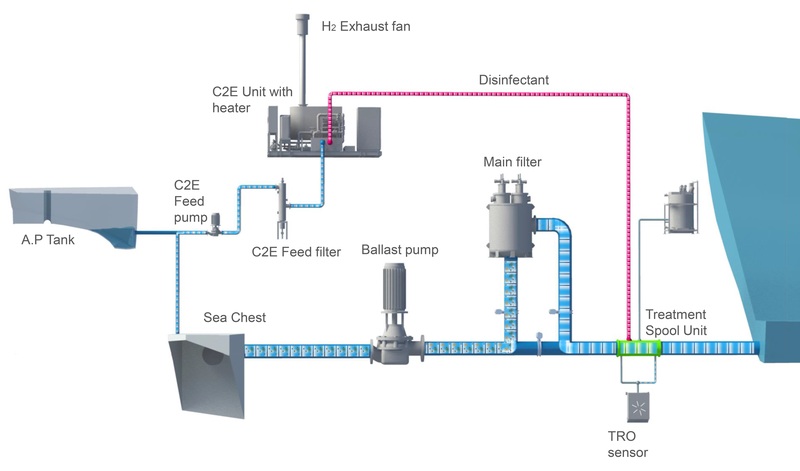 TeamTec Oceansaver® ballast water management technology is based on the principle of filtration and disinfection by side stream electrodialysis. The BWMS can be installed on all types of vessels, and is the preferred system for quality minded owners. Our vast range of models cover capacities from 200 m3/h up to 7200 m3/h flow rate. Below is a typical system layout for a vessel with one ballast water loop. Water is pumped on board by the ballast pump, filtrated by our automatic back flushing 40 micron filter and then subjected to our disinfectant. The disinfectant is produced by our patented C2E unit which is supplied with seawater from a separate loop. TRO levels in the water are measured and the system automatically adjusts the disinfectant production in order to reduce power consumption, in addition to ensure that the ballasted water is treated according to the regulations. USCG Type Approval without restrictions Oceansaver® BWMS was awarded a full unrestricted type approval certificate from the US Coast Guard on December 23rd 2016 as the first electrochlorination system in the world. US regulations require that all vessels trading in US waters to treat their ballast water with USCG Type Approved ballast water treatment system before discharge. IMO Type Approval Oceansaver® BWTS is fully compliant with the IMO Ballast Water performance standards and complies with all the requirements in the International Convention for the Control and Management of Ships’ Ballast Water and Sediments. The system has been rigorously tested achieving and surpassing the legislated requirements and holds a full type approval for the entire range of systems from both DNV GL and ABS. TeamTec Oceansaver® BWMS has been successfully delivered on vessels classed with DNV GL, ABS, Lloyd’s Register, BV, ClassNK amongst others. Ex certificate for hazardous area installations Oceansaver® BWMS’ unique design features an «Approval in Principle» for gas hazardous areas installations, which is incorporated into the Type Approval. This allows the system to be installed on crude oil, product and chemical tankers.